Windows 10 offers a few ways to help you find your mouse pointer, which can be a problem on high-definition and laptop screens. Sometimes, just slowing down the speed it moves solves the problem, but you can also make it more visible and even have Windows locate it for you. One of the first things we’re going to change is the speed at which the pointer moves. Perhaps the only reason you’re unable to see it is that it’s darting across the screen too fast. Slowing it down will give you a chance to locate it before it ends up hiding at the very edge of your screen. Open up Control panel, head to Control Panel > Hardware and Sound > Mouse, and click on the “Pointer Options” tab at the top of the window. The Motion slider here dictates the speed at which your pointer will move. Sliding to the right to make it faster; slide to the left to slow it down. You’ll have to experiment to find the right setting for you. What you’re looking for is something fast enough that you can get across the full width of your display without too much hand movement, but not so fast that your pointer disappears on you. This feature accelerates the pointer by predicting the movements of a mouse or trackpad. Windows will monitor the speed you’re moving the mouse and adjusts your speed on the fly. The faster you move your mouse, the further the pointer goes, while the opposite is true if you move your mouse slower. 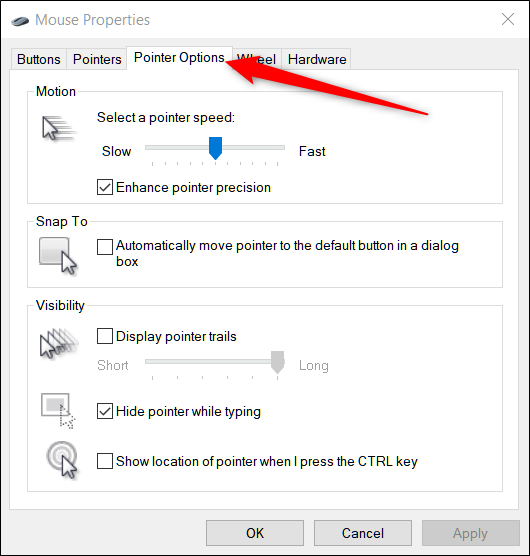 With this option disabled, your pointer movements are directly correlated to the distance you move your mouse and with it enabled, the pointer’s moves are based on what Windows thinks is best. If you’re still having trouble finding your pointer, you can add a trail that follows it around—kind of like the tail of a comet. Any time you move your mouse, the pointer will have a trail of other pointers following it around, helping you catch a glimpse of it as it soars across your desktop. The next method you can use to increase the visibility of your pointer is to change the color and size. You can use the Windows standard white, change it to black, or even invert the color. Open up the Control Panel and head on over to Control Panel > Ease of Access > Ease of Access Center > Make the mouse easier to use. Under the Mouse Pointers heading, choose the color and size of the pointer you want to use. The default is “Regular White.” Select a Scheme and size, and then click “Apply” to try it out immediately. If you don’t like the way it looks, select a different scheme. The inverted scheme is great for people who have a hard time seeing the default white. If you chose the inverting scheme, your pointer dynamically changes to the inverse color of whatever you’re hovering over. Finally, if you’re still having troubles locating the pointer, then there is one last feature you can use to find it. This one acts as a sort of beacon for your pointer and sends a ripple towards it, showing you exactly where it is when you press the Ctrl key. First, head back to Control Panel > Hardware and Sound > Mouse > Pointer Options. Now any time you press the Ctrl key, Windows shows you the pointer’s location.